The best single food item I ever ate was a knee-buckling, life-altering, chocolate crepe from a street vendor on the Boulevard du Montparnasse on the left bank of Paris. Maybe it was so good because I was cold and it was warm. Or maybe it was because I was 25 and it was Paris. But maybe – just maybe – it was so downright delicious because it was so unexpected, something I just happened upon while wandering down the street on my very first night in the city of lights. I never found that crepe stand again. And that too was part of the allure. The search and the find – and sometimes even the loss – makes the treat that much more desired. Crepe stands are a dime a dozen on the boulevards of Paris. 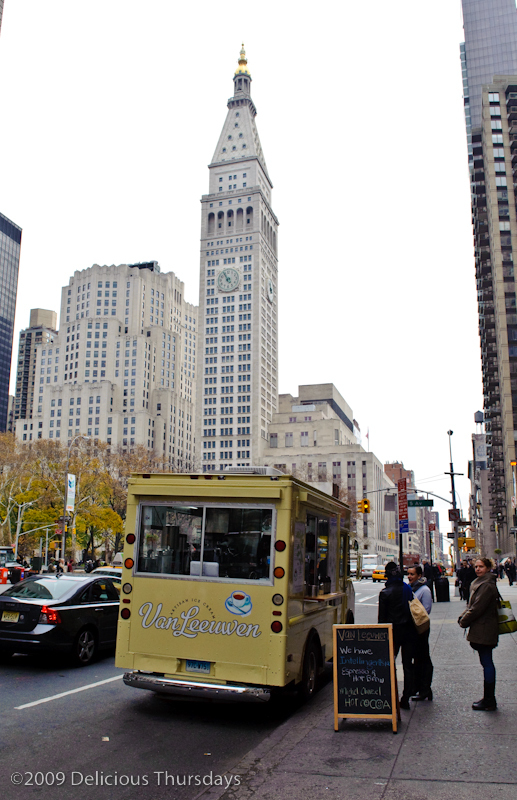 The Van Leeuwen Artisan Ice Cream Truck is a touch harder to track down. 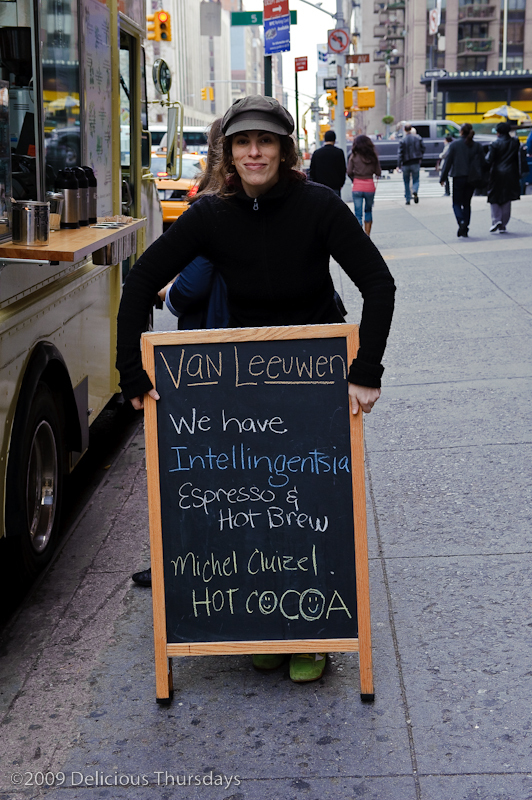 I spent my Thursday in confined quarters alongside gallons of all-natural artisan ice cream, meltingly delicious Michel Cluizel hot chocolate and perfectly brewed Intelligentsia coffee. 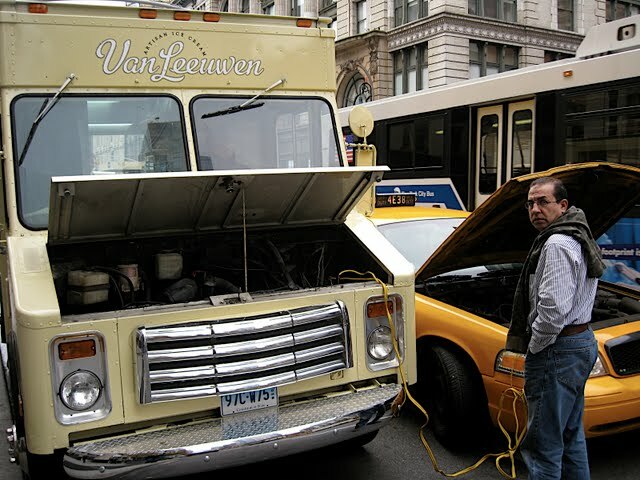 I also got cozy with jumper cables and power cords – proving that the life of a Food Trucker is truly a challenging one. I am up before the sun at 4:30 in the morning. I take a drowsy shower and pray that the scalding hot water snaps me out of my sleeping state. No such luck. I travel deep into an unknown, unexplored and undesirable part of Brooklyn. By 6AM it is still dark and I am still cold. I am standing on a street corner in an industrial section of Bushwick. I am alone, with the exception of a few hooded locals who brush me by. This is not the friendliest neighborhood. But granted – it’s early. Finally, I set my eyes on two welcoming sites moving speedily in my direction. The first is Mandi, a 5 foot 9 inch, slender, graceful, willowy, blond-haired former model turned college student. She wears no makeup but is simply and naturally stunning. With peaches & cream skin and strawberry lips – she’s as delightful as the ice cream she will be serving later today. To call her beautiful is an understatement. I prefer the word angelic. 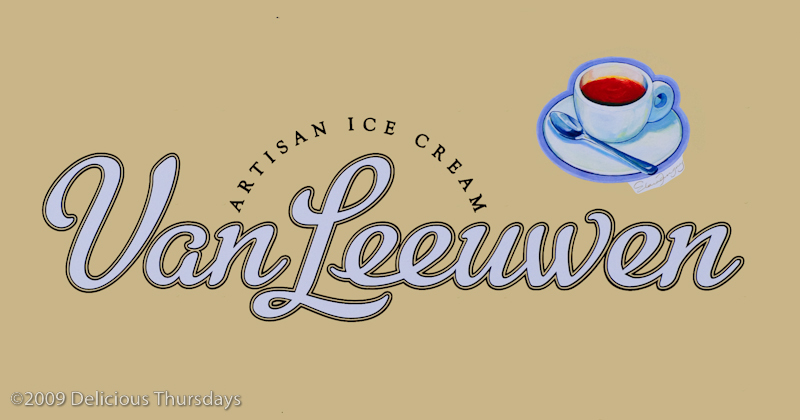 Trust me – if you see Mandi in the window of the Van Leeuwen Ice Cream Truck, you would definitely want to buy a scoop from her. Maybe even two. Even in the cold. 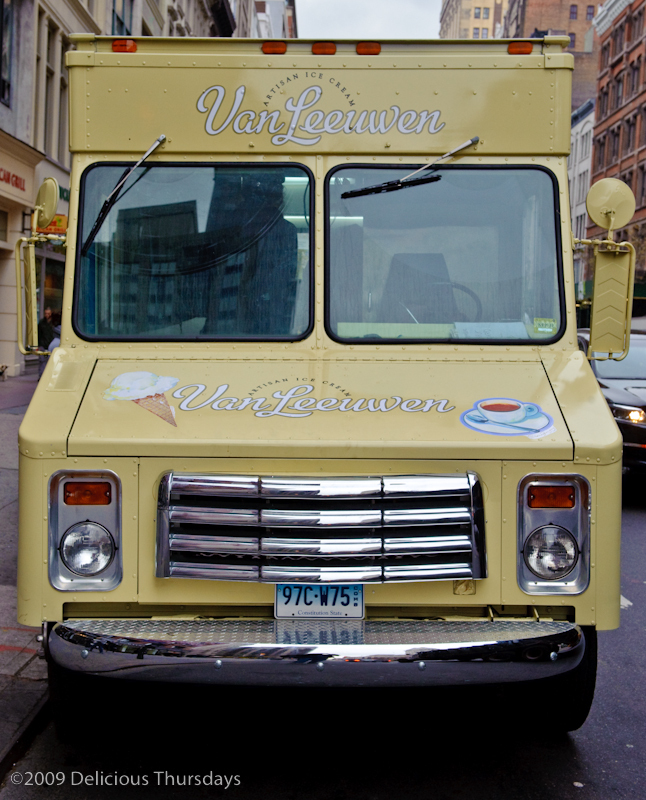 The other site I see is equally as alluring: The Van Leeuwen Artisan Ice Cream Truck. 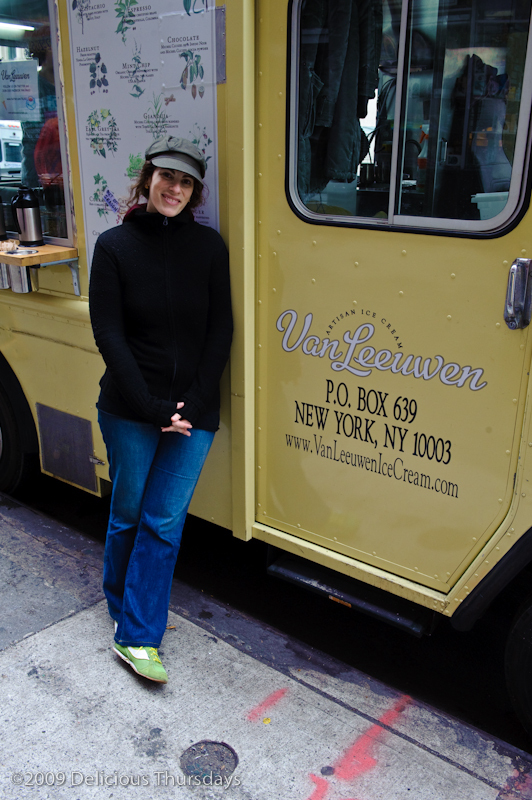 She is a former postal truck with a gorgeous makeover. Your typically ugly duckling turn swan story. Not only is her exterior striking – she’s got the goods inside as well. Mandi and I unplug the truck from its power source and stock her full of treats. It’s going to be a rocky ride so we lock everything – from cups to cones – in place in an effort to avoid showering the streets of Brooklyn with ice cream and hot fudge. Although, I can think of worse things. The garage door raises and the first streaks of sunlight begin to appear. 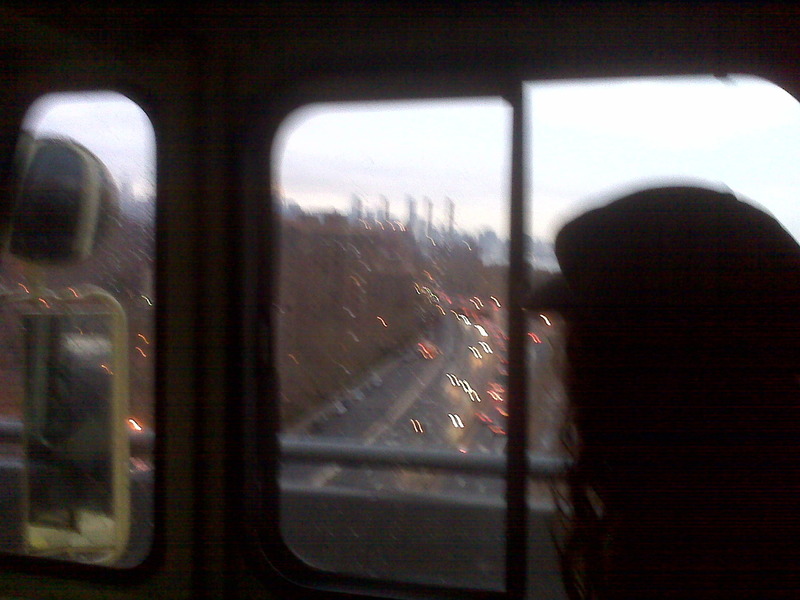 We drive, Mandi at the wheel and me in the passenger seat, over the Williamsburg Bridge and up 1st Avenue. We steal a series of snapshots of the Manhattan skyline at sunrise, along the way. It’s a bumpy and loud ride with lots of rattling in the back but Mandi takes the corners quite smoothly. I’m just thankful I’m not driving. The last time I found myself behind the wheel of a truck was in 2004 when I drove a 16 foot Penske for 24 hours straight. I drove – 75 miles an hour and full speed ahead – desperate to arrive back home in New York after five years of South Florida living. I handled the road with much less grace than Mandi. I have a vague recollection of visiting a gas station in New Jersey and taking its roof with me when I left. I also got lost 10 minutes from my parent’s house in Hampton Bays – a town I had lived in for 25 years. Lets just say that if I was driving in place of Mandi, the world might not have gotten their ice cream. We park on the corner of 19th Street and 6th Avenue and like any fancy lady standing on a street corner before 8am, the truck seems to attract alot of attention. She is dressed in a soft, pale, buttery yellow with delicate drawings of vanilla beans, ginger and mint leaves dotted throughout her exterior. 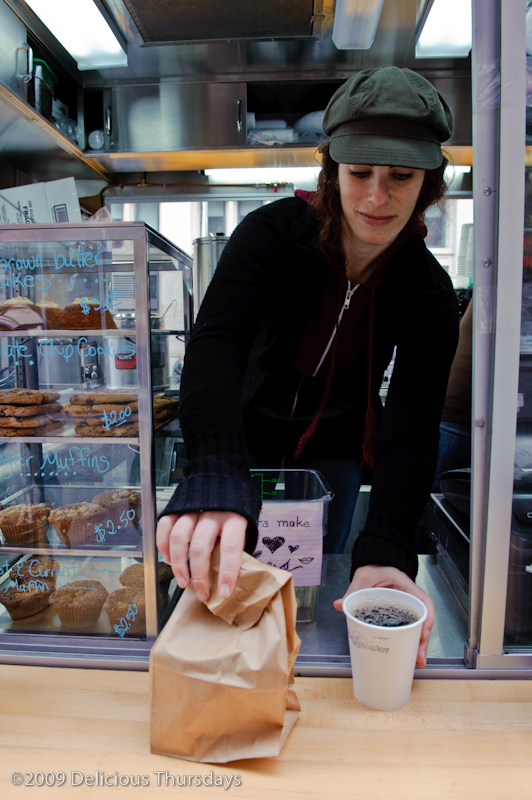 Large open windows fill the truck with light and confirm that her ingredients have no secrets: Ice creams filled with Sicilian pistachios, pure organic peppermint, Hudson Valley red currants and fair trade coffee beans. Before we have even turned off the lights up front, we have a customer standing at the window in back. It is only 7AM and she has already begun to sing her siren song. As customers walk up to the truck I listen closely to their conversations. I notice bursts of excitement and shouts of glee as they round the corner and set their eyes upon this truck full of treats.”Oh there she is” and “cool, we found it” litter the pavement as they approach. Coffee-deprived customers come to the window and tell us how they have been searching for us all along the stretch of 23rd Street until they finally discovered us here. This is the nature of our business. The truck moves from block to block – never wearing out her welcome and never staying too long in one place – like a lover playing hard to get. Now that they’ve found her – I can see relief in their eyes. 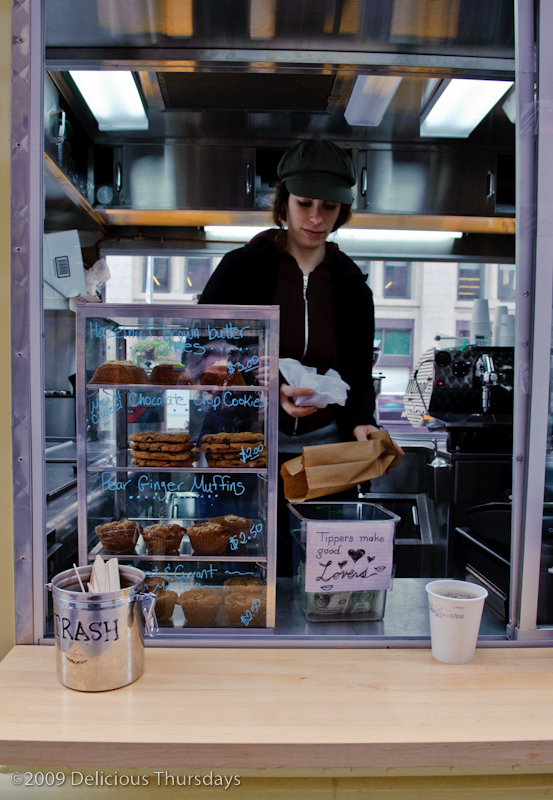 We are nestled close to the curb on 6th Avenue with a McDonald’s to our South and Cosi sandwich shop to the North. I can see Staples on my left and Burlington Coat Factory up ahead. In a sea of sameness and chain store monotony, this little truck stands out as different. And different we are. Our front door is a window. Our welcome mat is the curb. Our address is wherever we can find a spot. The weather is both friend and foe. We stand in danger of getting side swiped and losing a mirror and when the street sweeper rides by, he rattles our little shop of meals on wheels. Lots of things can happen that most store front shops never think about. We might even lose our generator power or leave the headlights on too long and burn out the battery – which, unfortunately, we did. 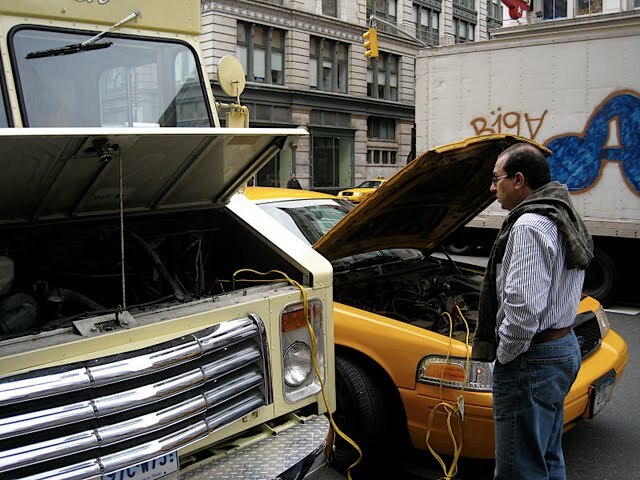 In an attempt to move the truck from 6th Avenue and head to 23rd Street we discover a dead battery. I think this is the truck’s attempt to show us who calls the shots in this relationship. She will not be taken for granted. Surrendering to her power, Mandi and I hop out with jumper cables in hand and attempt to flag down anyone who might give us jump. We stand there, helpless, for about 10 minutes. 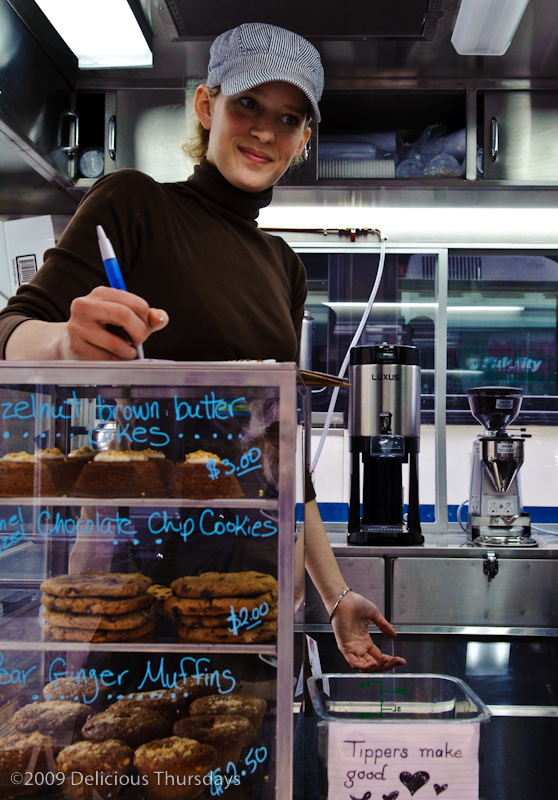 We offer everything from ice cream to a steaming cup of hot chocolate. We get many rejections. Finally a NYC taxi pulls over with Sharif at the wheel. It takes quite a while to get enough juice to turn the engine over and Sharif patiently waits with us until we have success. In Arabic Sharif means honest and noble – and I think he was. Jump started and ready to roll, Mandi and I round the corner to 23rd Street near 5th Avenue. As soon as we park, and before we are even ready to serve, the line forms as if we are The Beatles and the fans have been chasing us from 4 blocks away for an autograph. Granted, Mandi is a former model, but this time it’s the ice cream they are after. “You moved. Why did you move?” they ask, feeling deserted by their dessert. But just like Khaled, we make up for it by plying them with sweetness: pear ginger muffins with brown sugar on top, hazelnut brown butter cakes with mascarpone, and bowls of ice cream in ginger and giandujia (pronounced jahn-doo-yah) and my favorite – Affogato al Caffè – Vanilla ice cream drowned in espresso – perfect for a chilly day. Working the ice cream truck is nothing new in my family. In the summer of 1960, at the age of 18, my father was employed as an ice cream man for the Freezer Fresh truck. He was stationed in Dyker Heights, Brooklyn and he was required to work every day as long as it wasn’t raining. Weather permitting, he would work from 10AM until midnight – quite a long shift. Unfortunately for him, he happened to start working during a particularly dry stretch of summer – not a cloud in the sky. He lasted only two weeks – considering himself more of a beach bum than an ice cream man. It all worked out quite nicely though. After only three weeks my father found himself hanging out on Manhattan Beach and sharing a beach blanket with a lovely girl named June. I guess she didn’t think he was such a beach bum. They have been married for 42 years. It’s afternoon and Mandi and I are a little worn down from our battle with the battery. She’s off to study for an exam and I’m off to sleep. 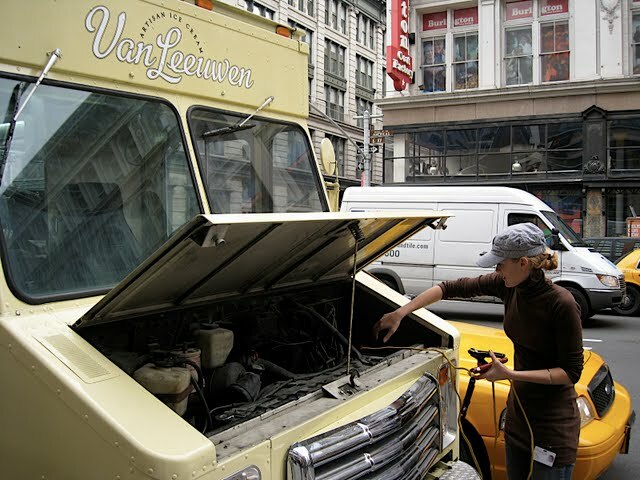 Working on a food truck is not simply about the food – it’s about the truck too. She needs to be tended to and taken care of. 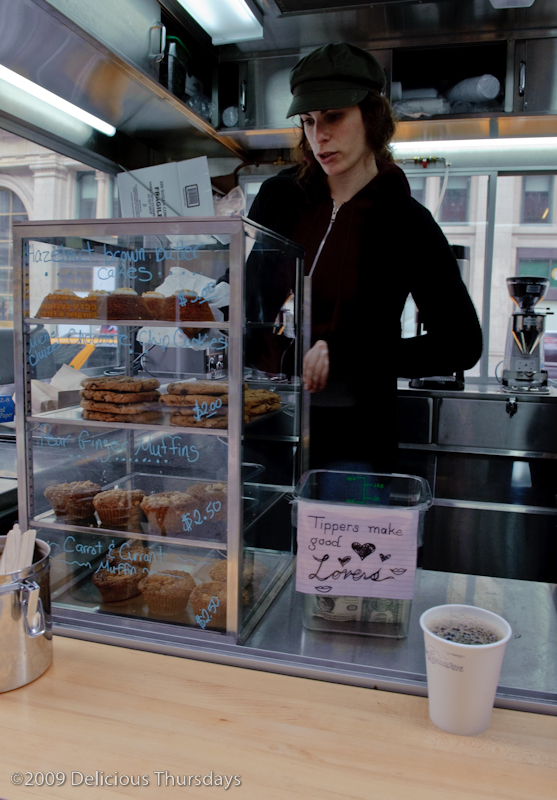 After all, she is a highly coveted sight on the streets of NYC. She is also an independent and mobile creature, who doesn’t wait around for someone else to come calling. She goes where she wants to go and does what she wants to do – and if you’re lucky enough to find her – you will indeed be rewarded. And if you happen to make your way to the streets of Paris and you find a fantastic chocolate crepe somewhere on the left bank – say hello for me.